The richly symbolic language of the opening chapters of Genesis pictures God as creating all things 'good', with humanity forming the climax of God's creative work. 'The man' and 'the woman' of Genesis 2 transgressed the divine command, ate the forbidden fruit, and lost both their innocent relationship with one another and their trusting relationship with God. 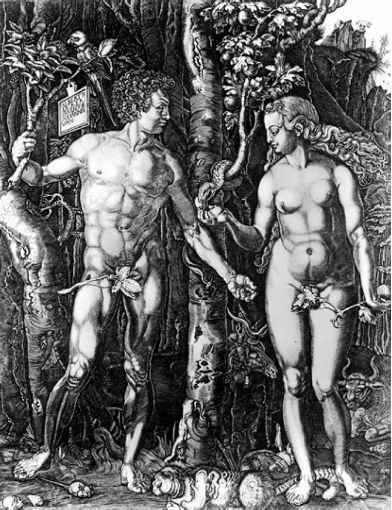 The story vividly portrays their loss of innocence and urge to redress their self-image: 'The eyes of both were opened, and they knew that they were naked; and they sewed fig leaves together, and made loincloths for themselves' (Gen. 3: 7). They now 'knew' through their experience the difference between 'good' and 'evil' (Gen. 3: 5). In their guilt they tried to hide 'themselves from the presence of the Lord God' (Gen. 3: 8). Those who hoped that eating the forbidden fruit would make them even more 'like God' (Gen. 3: 5) now anxiously try to get away from God. Sin has disrupted their basic relationship with their divine Lord. The story of the first sin brilliantly presents what everyman and everywoman do: their instinct is to put the blame on someone else. The man blames the woman and even God: 'the woman whom you gave to be with me, she gave me fruit from the tree' (Gen. 3: 11). The woman blames the crafty serpent who tempted her: 'the serpent tricked me, and I ate' (Gen. 3: 13). But the man and the woman have deliberately disobeyed the divine will and must suffer the consequences. shall bring forth children' (Gen. 3: 16). In place of an ideal relationship of joyful equality and mutual dependence intended by the creator (Gen. 2: 18—23), the woman finds herself 'ruled over' by her husband (Gen. 3: 16) and named by him 'Eve' (Gen. 3: 20). Where pain now characterizes the woman's experience of giving life through childbearing, something similar holds true of the man. His work in cultivating the garden should have been normal and natural (Gen. 2: 15), but sin turns work into distressing toil (Gen. 3: 17—19). In bringing life, in this case by gaining bread from the ground and its crops, the man too will have to suffer pain. In language that is as fresh as ever, the Genesis story drives home the point: far from enhancing their life, sin leaves the man and the woman less than what they should really be, and ushers in destructive consequences. The most distressing consequence concerns death. Fashioned from dust (Gen. 2: 7), the man and the woman are by nature mortal; their death should have been like that of Abraham, who was to die surrounded by his family in 'ripe old age'—a death that peacefully completes a life spent in faithful obedience to God (Gen. 25: 1—11).112 But disobedience to God has changed the experience of death for sinful human beings; death has become a troubling, inexorable fate (Gen. 3: 19), a distressing sign of sin. Flanked by suffering and pain, death signals the radical change sin has brought to the human condition. Having made a decision unworthy of those created in the divine image (Gen. 1: 26—7), the man and the woman are banished from the garden of Eden into a foreign place. Cherubim and a flaming sword now guard the entrance to the garden and 'the way to the tree of life' (Gen. 3: 24). Other books of the Bible will use exile and suffering in a foreign land to symbolize sin and the lot of sinners: Jesus' parable of the lost son, for example, pictures the dissolute sinner as leaving his parental home for 'a distant country' (Luke 15: 13). The last book of the Bible will portray final damnation as 'the second death' to which the damned will be banished (Rev 20: 10, 14) and final redemption as entering a heavenly Jerusalem and receiving God's abundant blessings from the 'tree of life'. For humanity, paradise regained will mean re-entering the garden and being given access to the final 'tree of life', watered by the river of life coming from the Lamb (Rev. 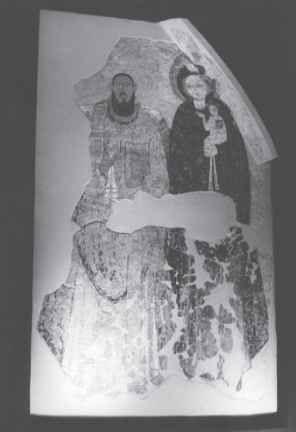 22: 1-2). 112 According to the Yahwist tradition, physical death is humanity's return to dust and the handing back of life's breath to God. The OT expresses a firm belief in afterlife only in post-exilic times. The Genesis story sees the disobedience of Adam and Eve as initiating an avalanche of sins. Cain murders his brother; this fratricide paves the way for a terrifying increase of violence and the unbridled revenge killings practised by Cain's descendant, Lamech (Gen. 4: 8, 23—4). Violence also brings a breach of boundaries between heaven and earth. 'Beings of the heavenly court' take human wives even though their offspring remain mortal and do not become semi-divine (Gen. 6: 1—4). Whatever the source of this fragment of mythology, lustful practices contribute to the steady advance of sin that degrades the human condition. Once called 'good' (Gen. 1: 31), the earth itself is now corrupted through the wicked deeds of human beings (Gen. 6: 11—13). In their colourful way, the opening chapters of Genesis show human beings opting against God and one another. Evil decisions coalesce and shape a whole situation of sin, which needs 'cleansing' to allow for a new beginning (Gen. 9: 1—7). Although God's judgement takes the form of a catastrophic flood, the merciful love of God still operates. Earlier in the Genesis story, God provides garments of skin to replace the flimsy clothing of fig leaves, and fittingly dresses up the man and the woman after they sin (Gen. 3: 21). He puts a 'mark' on the first murderer, so that no one would kill Cain (Gen. 4: 15). Then, the Bible uses Babylonian traditions of prehistoric floods to highlight God's faithful mercy that sharply contrasts with the stubbornness and the sinful inclinations of the human heart. At the flood, God respects human freedom and offers all people the option of avoiding the impending doom. He then rescues Noah and a remnant of human beings and animals: they are the ones who have taken up God's offer (Gen. 6: 5—8: 22). Notwithstanding the new beginning marked by God's covenant with Noah, the history of sin continues. The story of the tower of Babel expresses an arrogant attempt to overreach human limitations (Gen. 11: 1—9). The attempt ends in an insuperable breakdown in human communications: the people are scattered over the face of the earth and their one language is broken up into many. The biblical text takes an old legend about the origin of the different language groups and uses it to symbolize proud desires to procure fame and security, something that quickly proves self-destructive (Gen. 11: 4). Genesis thus illustrates how sin advances gradually, steadily, and inexorably. It has a 'history': the sum of many individual, free, and concrete choices that coalesce to alienate humanity from God. Unlike the man and the woman of Gen. 3, sin cannot be blamed on 'the serpent' or some other obnoxious source. Humanity chooses to become 'like God' and to experience existentially ('to know') the difference between good and evil (Gen. 3: 5). The avalanche effect of sin, before and after the flood, continues to account for the progressive separation sin brings between the creator and humankind. The sum of so many single evil options forms a wedge that pushes God and humanity further apart. The cherubim with the flaming swords at the garden's door (Gen. 3: 24) symbolize the need for repentance, conversion, and purification. Only thus can humanity again receive access to its creator. The opening chapters of Genesis present the sinfulness that emerged at humanity's origins and left an enduring legacy of evil in options against God, oneself, other human beings, and created nature. Catholic Christianity came to express that heritage in terms of inherited 'original' sin and deliberate personal sin.